Joe Gores' DKA novels are in the CU through a story where Dan Kearney met the ghost of the Continental Op. In this DKA book, a couple of cops receive help on a case from an L.A. Homicide detective named Harry Bosch. Bosch is featured in a series of novels by Michael Connelly. All of Connelly's novels take place in the same universe. Bosch has a cameo in Robert Crais' Elvis Cole novel The Last Detective, while Cole cameos in the Bosch novel Lost Light. Like Connelly, Crais sets most of his novels in the same universe. Bosch also cameos in Paula L. Woods' Charlotte Justice novel Strange Bedfellows. Finally, in the story "Red Eye" in the all-crossover anthology FaceOff, Bosch meets Dennis Lehane's Boston P.I. Patrick Kenzie. Joe Gore was an interesting person. Like Dashiell Hammett before him he was a real private investigator who turned to writing mystery novels. They both lived in San Francisco and strangely died on the same day. 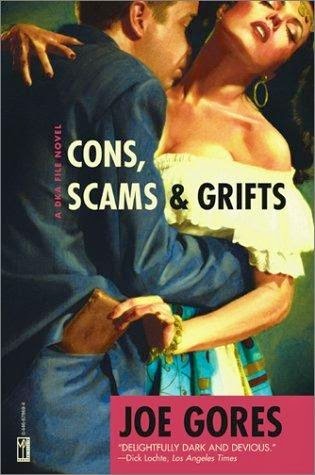 It's worth mentioning that Cons is a sequel to 32 Cadillacs which has appearance from Donald Westlake's ill luck thief Dortmunder. I'm pretty sure that you know that since I sent you a list of Westlake crossovers, but I figure it's worth mentioning for anybody unfamiliar with the books. I just started rereading Crais's novel Suspect. It's linked by mention a crime scene technician from Crais's other novels. According to Crais's website the protagonists of Suspect will be teaming with Elvis Cole in his next novel. This seems to be a trend among crime writers of creating their own interconnected universe, Robert Parker, Michael Connelly, Robert Crais. I remember Ross Thomas did it too, though I don't think there's any links to the CU in his work. I'm looking forward to the next Crais novel.